Research suggests that programming may take place through epigenetic effects such as methylation of DNA and acetylation of histones. Our research in India has suggested a strong role for nutrients in the 1-C metabolism pathway in fetal programming. We are focussing on understanding the role of 1-C metabolites in fetal programming, and in understanding differences in methylation patterns influenced by nutrition. In the Pune Vitamin B12 Trial, we are collecting cord blood and placental samples for extensive molecular biology investigations. We will undertake high-throughput analysis of the methylome, transcriptome and the metabolome on cord blood samples. 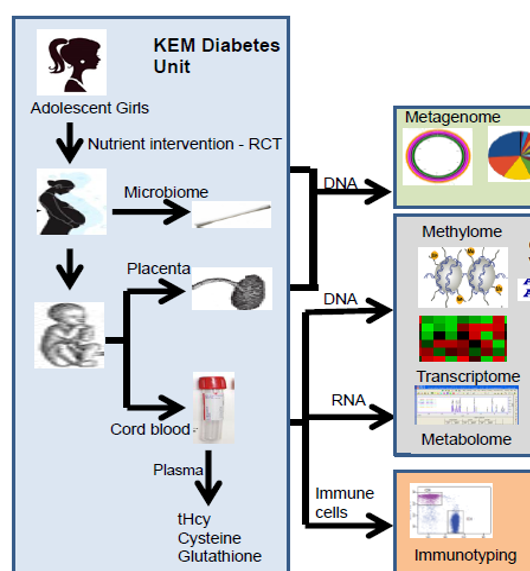 This will enable us to identify molecular signatures that predict fetal programming, and identify rationally refined strategies for nutritional intervention of young girls to cardiometabolic disease in the next generation. We have recently secured funding to study genome-wide DNA methylation patterns in 5-8 year old children whose mothers participated in two pre- and peri-conceptional micronutrient supplementation trials (the Mumbai Maternal Nutrition Project in India and the Peri-conceptional Multiple Micronutrient Supplementation Trial in rural Gambia). The latter is in collaboration with Andrew Prentice and colleagues at the MRC Unit, The Gambia. We will correlate any differences in methylation patterns between intervention and control groups with health-related outcomes in the children, including size at birth, post-natal growth, and childhood body composition, cardiometabolic risk markers and cognitive ability, and compare these associations between the two cohorts. We have demonstrated that 1-C micronutrient insufficiencies are associated with hyperhomocysteinemia. There is limited information on the integrated changes in 1-C metabolism in response to multi-nutrient insufficiency. 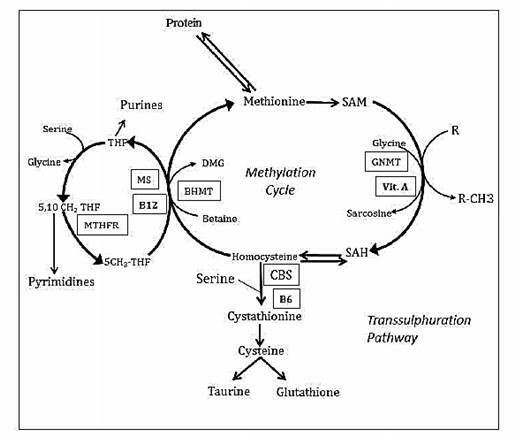 Methionine challenge tests (MCT) provide a comprehensive view of 1-C metabolism. We are undertaking these tests on pregnant and non-pregnant women, including before and after micronutrient supplementation in vitamin B12 deficient young women. We propose to use tracer isotopic studies to help in further understanding the role of the transmethylation and transsulfuration pathways in multi-nutrient deficient populations.